Welcome community with an addition of inviting Riverstone wood park benches offering convenient, bold and stylish seating. 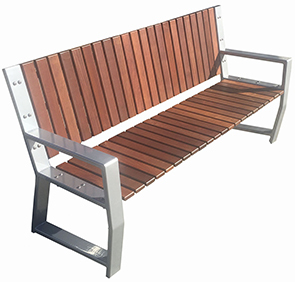 Constructed utilizing a combination of IPE wood and powder-coated steel materials, these industrial chic 5-1/2" benches are expertly crafted to provide lasting aesthetics and performance. The modern industrial bench design is highlighted by the 3/4" vertically slatted Ipe backrest and seat assembly, complemented by the rugged 1" x 3" steel frame. 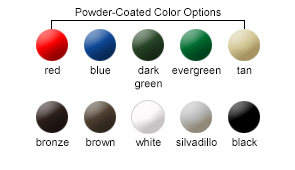 Riverstone bench frames are available in a selection of popular powder-coated finish color options to readily complement a vast assortment of landscapes and architecture.